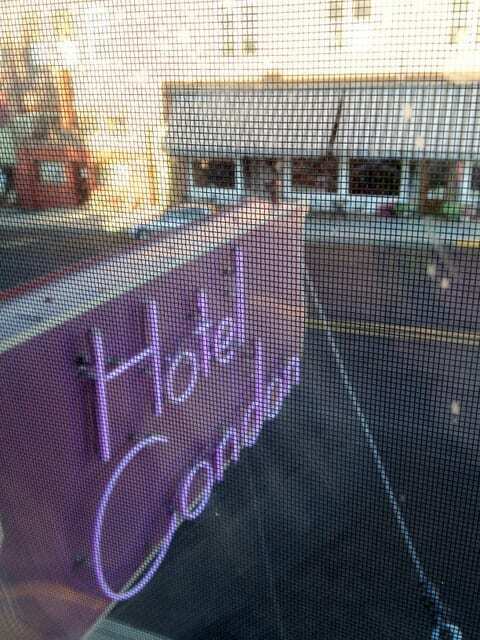 I’ve recently been contacted by readers, despairing that my top hotel picks are either priced out of reach or unavailable for the upcoming summer. Family hotels in Portland, Victoria, Vancouver and Seattle are booked solid, sold out and too expensive! Well, no surprise — I’ve dealt with the same situation, even as a travel writer. Here’s what I typically do when faced with sold-out hotel rooms, a planned trip and kids. 1. Set up in the suburbs. Now, some suburbs are better than others. For example, many suburbs of Vancouver offer the SkyTrain option into downtown Vancouver, so I’ll look for hotels near the SkyTrain. Portland offers this as well. Seattle is still working on getting their transit act together, so that’s not as much fun — but I’ve done it. Worst case scenario, I resign to driving into the city and paying for parking. 2. Use Priceline’s “Express Deals” tab. If it’s a heavily-booked weekend, I probably won’t hook a successful, low-priced bid for a decent hotel in my desired destination. But the “Express Deals” usually work at hitting the sweet spot of price and location. The potential downside: because you don’t get to choose your bedding type, you may end up with one King, three kids, and no sleep. To circumvent this, look for “Bed choice available” in the text of the express deal. This can allow you to choose two Queens, two doubles, or whatever you need. OR arrive very, very early in the morning, and you may end up with a bed choice (this has always worked for us, but we arrive at 9 a.m.). 3. BYOB (bring your own bed). With a teen and a kid (who will not share a bed with one another), I bring an air mattress for my younger child, or build a “sleep nest” out of pillows, cushions, blankets, and more pillows. This allows me some flexibility in the kind of bedding arrangements we can find, or which type of Priceline stay we reserve. 4. Get very creative or expand the budget. Home swaps? VRBO? AirBnB? Non-reservable, last-minute camping spots? Hostel rooms — there are family rooms available, but often booked far in advance; with teens you might find the bunk options reasonable? Vacation swaps? Petsitting or housesitting stays (I’ve found great petsitters through trustedhousesitters.com, although I haven’t used it as a traveler, yet.)? 5. Ask about a waitlist. If I have my heart set on a specific hotel, I might call 24-48 hours in advance of a stay and ask if there have been any cancellations. Or I’ll call earlier and ask if there’s a waitlist of any sort. Smaller hotel owners may be willing to work with a family — they want their hotel or inn filled for the weekend. 6. Reschedule the trip. This is the worst option, but sometimes necessary. Look for a weekend that isn’t insane — weekend festivals can pack Northwest hotels. This only works if I’m driving, not flying. I’ve done it many times. I’m unwilling to pay $150 for a one-star hotel room in the grottiest part of town, and there’s always another weekend that could work. If making plans for summer, check out these new and upcoming kid-friendly museum exhibits in Seattle, Vancouver or Bend — the exhibits may inspire a day trip, weekend excursion or week-long adventure. From now through the end of summer, discover what lies beneath the sea’s deepest reaches, where few humans have ventured. 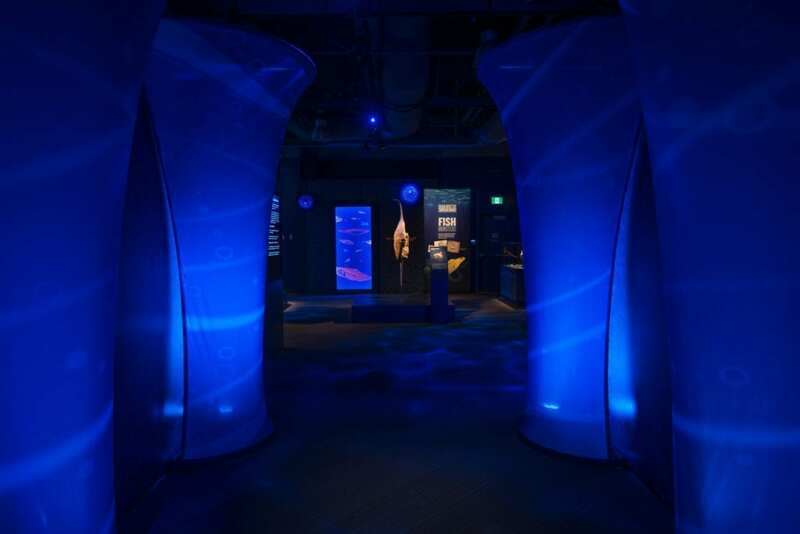 Sea Monsters Revealed uses plastination (seen in many human anatomy exhibits) to preserve the bodies of deep-sea creatures and ocean oddities, including a mako shark and a car-sized sunfish. Vancouver with Kids, Summer 2015: Sea Monster Exhibit. Photo courtesy Vancouver Aquarium. Pacific Science Center. Seattle, Washington. Two words: burp machine. This summer, animatronic exhibits and (probably too much) information edifies on snot, stink and other disgusting things that entertain kids. For example: The “Gas Attack” pinball game, “Urine: The Game,” a kidney-riffic experience, and a “Tour du Nose.” Despite being somewhat gross, it’s all in the service of teaching kids cool stuff about biology. Also, maybe, not to pick their noses so much. We’ll see. Meet dozens of dinosaurs that evolved in the Southern Hemisphere, in the flesh (or close to it). The exhibit combines augmented-reality tech with fossils to create realistic Southern-Hemisphere dinos rarely found in North America, including those that outsize the toddler-beloved T. Rex. Seattle Art Museum. Seattle, Washington. This exhibit will include 50 masks and 10 costumes from SAM’s African art collection and about 100 objects on loan. The masks imitating and replicating animals are particularly fascinating for children. Open January 31 to October 4, 2015. If your kids are going through a Star Wars Phase (it’s a thing! ), check out the 60 costumes at this traveling exhibit. Costumes cover the movies’ greatest hits; your Chewbacca, your Leia, your Darth Sidious, and so on, and there’s also an opportunity to see how illustrations become costumes and interactive pieces that encourage kids to touch fabrics. Who knows, it may inspire a costume design (or two) at home, as well. He measured 48 feet long. He weighed up to 2,500 pounds. He was Titanoboa cerrejonensis, the largest snake in the world. This exhibit reveals more about the 60 million year old remains found in Columbia, along with other post-dino Paleocene critters. Skittish? It’s only a full-scale model of Titanoboa; the real thing is extinct. Whew. Kids at the turn of the 20th century — did they have it easy or rough? View kids’ clothes (like wooly chaps, kid-size saddle and Chinese shoes), learn about children’s work and play, and visit a replica of a child’s 1900 bedroom. Royal BC Museum. Victoria, BC. Understand more about why some people traveled continents to seek a fortune. See BC’s largest existing gold nugget (The Turnagain Nugget), indigenous, pre-hispanic gold art treasures from Columbia and a million-dollar coin (May 13 to June 14 only). 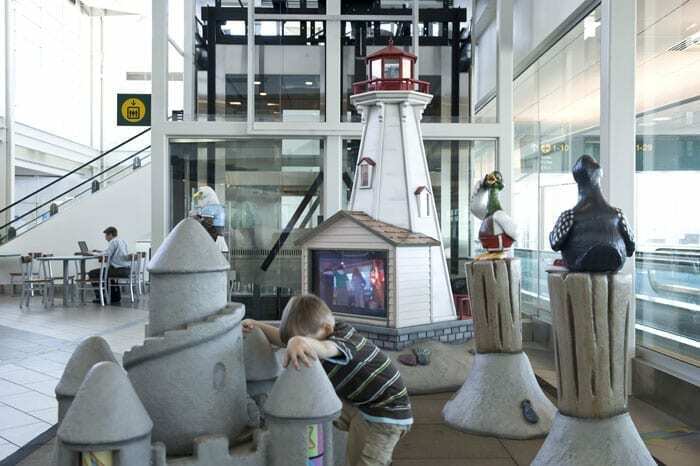 Whether you’re flying in or out of Vancouver International Airport (YVR) in British Columbia, you’ll find plenty to do with kids. I love the diversity of offerings — where else can you find an outdoor park, a play area, a hands-on observation deck and an on-site airport aquarium? There’s so many fun activities, you almost want to book a trip just to play. Here’s a full map of the Vancouver Airport. With three locations after security and one before security, there are a number of areas throughout the airport for kids to play and climb. Before security, near the domestic terminal food court (Departures Level 2), you’ll find a play area. A changing station is located within every washroom, male and female. A nursery room equipped with cribs, play pens and a changing area is available before-security in the United States Terminal, Departures Level 3. It can be accessed at a person’s request. It is a large, quiet area where parents can have some privacy if feeding or changing. There are family restrooms at every washroom location with full change stations. Of course, throughout the Pacific Northwest and BC, nursing in public is both accepted and welcomed. 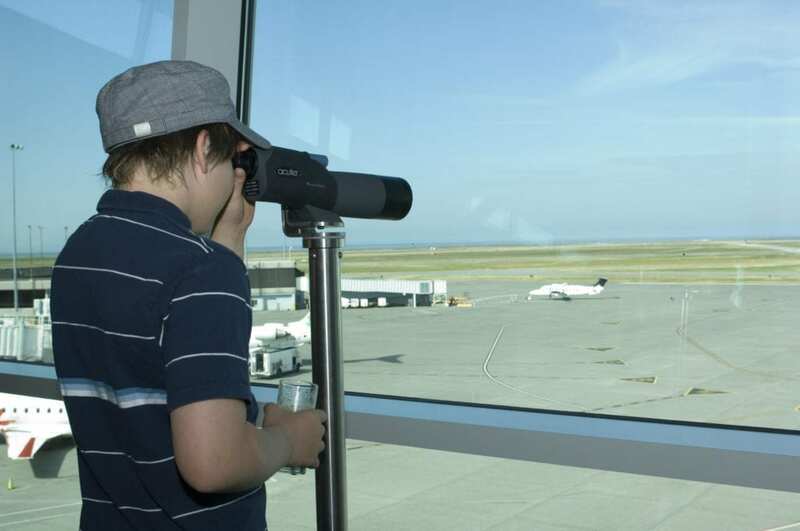 If you’ve got a child that loves to point to the skies every time an airplane flies overhead, you’ll want to take them to the Public Observation Area located before-security in the Domestic Terminal on Level 4. 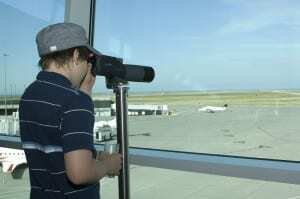 Peer through telescopes to watch aircraft land, listen in on air traffic control, or learn about airport careers. 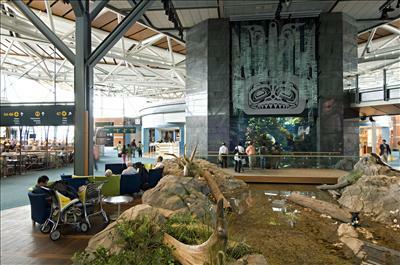 Located in the after-security area of the International Terminal is a 114,000-litre aquarium with over 5,000 aquatic dwellers. Kids can seek out a variety of Cascadia-native underwater fauna, including wolf eels, sea stars, sea urchins and more than 20 different species of fish. The Vancouver Aquarium also runs a duty-free store right at the airport, should you need some great souvenirs or toys for the plane ride home. For families needing a little fresh air, the airport’s Chester Johnson Park houses First Nations art including K’san Totem Poles. Located right outside the International Terminal (before security), Chester Johnson Park is a great spot to go for a walk and take in some of B.C.’s beautiful landscape. Miss 604 offers a great write-up of Chester Johnson Park. Read more about traveling with children here, at the Vancouver International Airport’s website. Thanks to Jenny Duncan for background information and photos. In British Columbia, Vancouver’s winter rains can make a Stanley Park visit dreary and walking the seawall with a toddler sheer drudgery. But in East Vancouver’s Riley Park neighborhood, The Aquatic Centre at Hillcrest Park is the perfect way for a family to splash away the doldrums. This 66,500 square foot water zone — and Olympic legacy facility — is now the largest pool in Vancouver, and includes a 70-person hot tub, separate dive and 50-meter lap swim tanks (with moveable floors), plus a lazy river and children’s area with playful fountains, showers and toys. The depth of the children’s pools is under 1 meter (a little over three feet), but there’s a zero-depth entry path, thanks to the focus on accessibility. In fact, the entire pool is designed with accessibility in mind, so wheelchair users can roll via a gentle ramp into all sections, even the hot tub and play area. 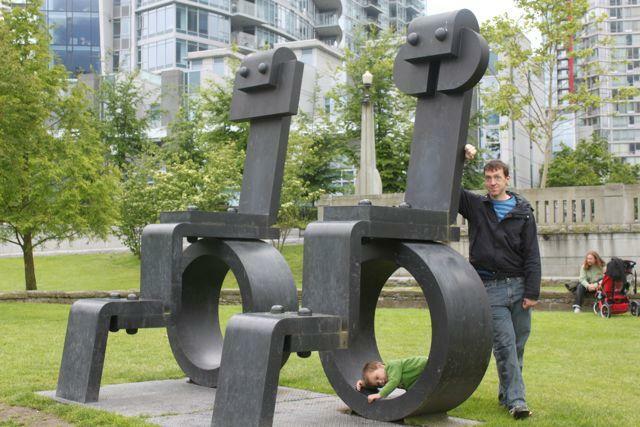 A bonus: it’s one more free thing to do with kids in Vancouver, if you’re the parent of a child under age three. Hillcrest Aquatic Centre. Photo Courtesy Vancouver Park Board. The pool complex embraces mid-century modern design, with knotty pine walls, globe-shaped lights and dramatic floor-to-ceiling window views of the North Shore. In short, it’s gorgeous. Hillcrest Aquatic Centre wasn’t as oppressively noisy as the traditional public pool from our childhood days — I think either the soundproofing or tall ceiling heights help. It’s also much cheaper than the typical resort waterpark. If you time your visit right, you can combine a trip here with the Vancouver Winter Farmers Market, an interesting (and more locally focused) alternative to the Granville Farmers’ Market. In summer, kids can enjoy the outdoor pool with sprays and bubble jets. Prices: $5.98/adult; $4.24/youth; $2.99 children (ages 3-12); Under-3s are free; Families (1-2 adults and children under age 18) are $2.99 each. Shortcut to Hillcrest Aquatic Centre schedule and prices. More Vancouver Pools, Spray Parks and Beaches. One of the best ways to really “meet” a city is through staying, playing and eating in a real neighborhood. You can hang out with other locals, discover in-the-know restaurants and shops, visit less-touristed attractions and generally trade in your anonymous experience for something a little more personal. This week, we have a special guest post on Vancouver’s Kitsilano neighborhood from Vancouver-based blogger Claudia Laroye, an avid traveller, mother of two, and author of thetravellingmom.ca blog. She is passionate about family travel and about educating children through the travel experience. Her blog offers a modern mom’s guide of ‘how to’ travel tips and information, as well as destination advice for the new or experienced traveller. She contributes to Tourism Vancouver’s InsideVancouver.ca, Canadian print publications, and other travel sites on the web. Let’s hear Claudia’s take on Vancouver’s hottest neighborhood. I’ve lived in Kitsilano for ten years. We’ve raised our children in this family-friendly neighborhood, and have felt very lucky to have done so. The neighborhood has everything – beaches, parks, restaurants, cafes, yogawear & clothing stores, and baby boutiques. It’s a funky area with high-density apartments and condos for young singletons and marrieds, and older single-family areas with larger (and now expensive) homes. Waking up from your night at the Granville Island Hotel, begin your day with croissants and coffee from the Granville Island Public Market or La Baguette et L’Echalotte. Walk west along the waterfront, following the footpath towards Vanier Park. Spend the morning exploring the Maritime Museum, including the RCMP ship the St. Roch – the first ship to circumnavigate North America. Continue walking west towards Kits Beach, and let the kids play in the newly renovated and accessible playground. Before lunch you can dip a toe into English Bay or visit Kits Pool, then stop for lunch at The Boathouse Restaurant at Kits Beach, or continue south a few blocks to Rocky Mountain Flatbread Co. at First & Cypress St.
You can spend the afternoon strolling the shops of West 4th Avenue, and take a playground break at Connaught Park, near the Kits Community Centre at 12th Ave. and Larch St. If it’s a summer weekend you may see soccer, rugby or cricket matches in progress. For late afternoon and dinner, pick up a bunch of picnic goodies from Choices or Capers, and head down to Jericho Beach for some water play and to watch the sun set. Another wonderful Kitsilano day! Kits is packed with Vancouver Tourism-brochure staples like the HR MacMillan Space Centre and Maritime Museum at Kits Point. Both of these museums are fantastic places to visit with kids, involving interactive displays, and lots of touching-feeling action. [The Maritime Museum has an online coupon for free kids admission with paying adult.] They are both located within walking distance of Granville Island (itself a major destination on the Kits/False Creek border), Kits Beach, and Kits Pool – which are popular destinations, particularly in summer. Kits Beach is the eastern-most point of the Kits beach ‘system’ that goes west towards UBC and Point Grey. The western beaches (in order east to west) are: Kits Beach, Jericho, Locarno and Spanish Banks. West of Spanish Banks the beachfront trail enters Pacific Spirit Regional Park at UBC. The beachfront trail is ideal for walking and biking, and all of the beaches are accessible by car, with free parking lots. Where do we start? 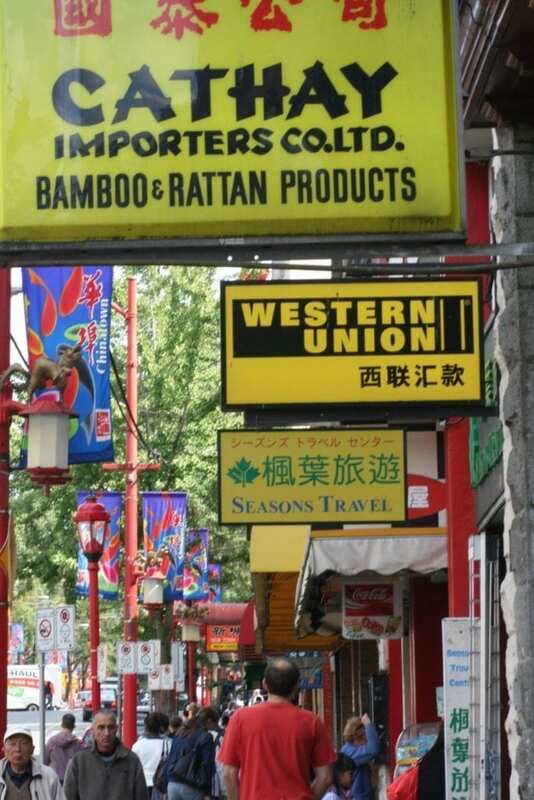 The main shopping streets in Kits can be found on W. 4th Avenue and West Broadway. There is also a niche shopping area at First & Yew near Kits Point. West 4th Avenue has morphed into a bustling commercial district with unique boutiques and cafes, and what I’d term yoga/activewear, housewares, and baby ‘zones’. 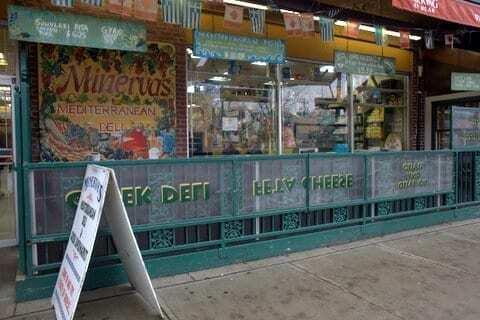 In other words, there are groupings of such retail clusters that specialize in baby and young children-related toys, clothes & supplies, as well as yogawear & various activewear retailers (think NorthFace, Helly Hansen, IceBreaker). Two not-to-be-missed stores for shopping for the under 5 set are Hip Baby and Crocodile Baby. For moms and dads, check out the original Lululemon location, and stroll the many funky boutique clothing and book shops. For the travel bug, Wanderlust is Canada’s largest travel retailer, with maps, luggage & books to suit planning for any and every future trip. On West Broadway, the flavors become more Greek, literally. This section of Kits attracted Greek immigrants 50+ years ago, and it’s still highly visible in the shops, restaurants, and even the banks. The annual Greek Day festival in June is a summer highlight in the neighborhood. Must visit shops include my favorite bookstore, Kidsbooks, as well as the Toy Jungle toy store, and the Just Imagine costume company. For traveling moms, browse the lovely trinkets at the WishList Boutique, and for sublime chocolates (for your own consumption or as gifts), do not miss Thomas Hass and his world of chocolate excellence. His Sparkle cookies are a local (and now world-famous) legend. 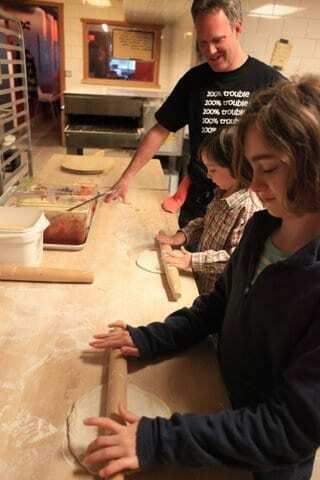 Rocky Mountain Flatbread Co. is a very Kits pizza parlor, with a kids play kitchen area and local, organic ingredients. Earl’s on Fir & Broadway for West Coast tasty. (Be warned: they have no high-chairs). The Eatery for a unique — and funky — sushi experience. Moderne Burger for awesome handmade burgers in an authentic diner setting. Terra Breads for bread, baked goods & sandwiches. White Spot for BC tradition & family friendliness. Banana Leaf for amazing Malaysian cuisine (sharing plates is encouraged). Capers (Whole Foods) for beach/park picnic supplies ‘to-go’ from their deli-restaurant. Maria’s Taverna for great Greek food. The best cafe (where cappuccinos approach those found in Rome, Italy), is at 49th Parallel, on 4th Avenue. It’s just the simply the best in town. Period. A delicious second choice is Caffe Artigiano, several locations. The one thing that Kits does not have a lot of are hotels. There are a few small-scale bed and breakfasts, catering often to couples and adults. However, the Rose Garden Suite at the quiet and lovely Greystone B&B can accommodate up to six people, with a full kitchen, and breakfast is included. The next best solution is staying at the Granville Island Hotel, in False Creek. It’s close to Kits, even within a pleasant walking distance, and is superbly located on the Island itself, near the Public and Kids Markets, community centre and artisan shops. The Hotel is also pet-friendly, the restaurant (Dockside) is kid-friendly, and the Granville Island playground and waterpark are within 200 feet of the hotel. If you’d like more Vancouver neighborhood recommendations, check out my book, Northwest Kid Trips: Portland, Seattle, Victoria, Vancouver . 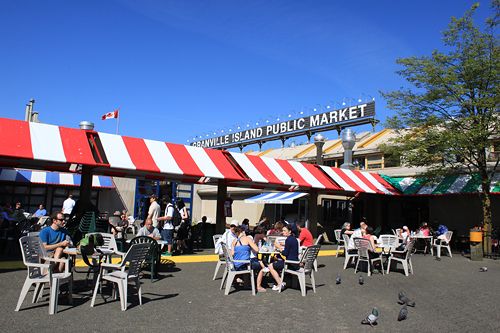 So, you’ve been to Granville Island. You’ve enjoyed the hip shops along Vancouver’s 4th Avenue. Ready for something different? Don’t want to buy just another mass-produced souvenir from the Robson stores? Here are seven indie-owned Vancouver shops that everyone will love. 1. Urban Source. 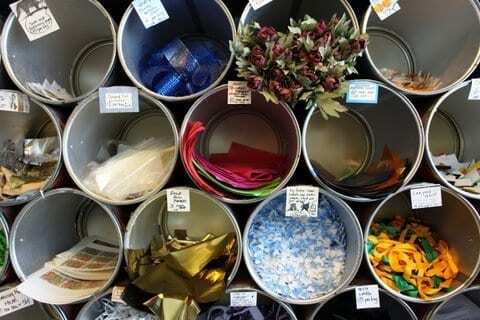 Hundreds of bits ‘n’ scraps fill this store – no, it’s not a hoarder’s dream. Instead, it’s a clever shop that challenges children and adults alike to craftily reuse and recycle. Take paper and caps and create a flight of fancy in the form of a bird, or make your own decorative wrapping paper. It’s a fun way to spend $10 and make something beautiful once you get home. 2. Regional Assembly of Text. If you’re helplessly devoted to type, this tiny shop will get your ink flowing. Create your own button-pin with the store’s typewriter and art supplies, browse cool ‘zines, select a handmade card, pick up a screenprinted shirt and otherwise immerse yourself in a type-cast world. GumDrops helps you weather the weather. 3. GumDrops. Yes, it rains here. A lot. That’s no reason to hide inside. 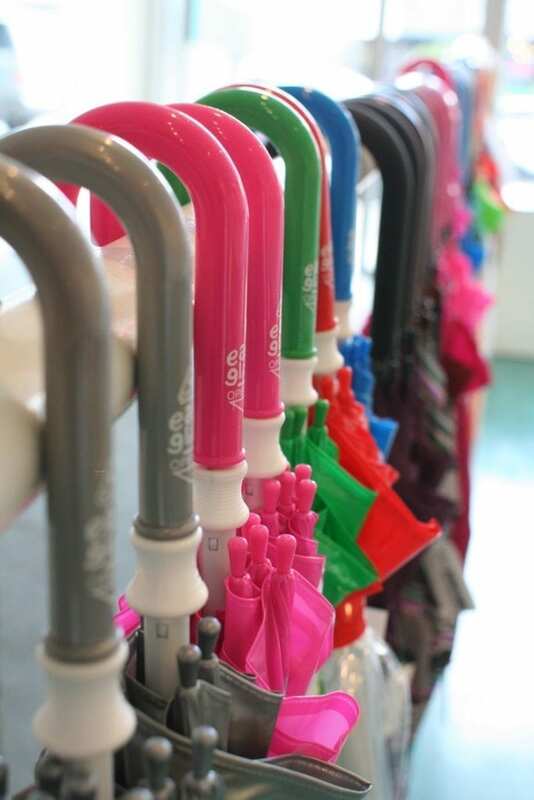 Head into the rain-focused GumDrops and pick up a gumball-colored matching set of raincoat, hat and boots. Children’s sizes are available, along with more sedate, urban rain fashions and summer (all weather!) sandals. You’ll weather any storm. 4. Miscellaneous shops in Chinatown. In Vancouver’s Chinatown, a stuffed-animal wave awaits even the pickiest of children. Shops overflow with Pikachu, Hello Kitty and Disney Princesses (some authorized, some questionably authorized). We particularly like browsing businesses for Totoro-themed school supplies, cool Chinese sandals and stuffed animals. Don’t forget to visit side streets to enjoy a serendipitous shopping experience. 5. Stepback offers clever vintage and refurbished housewares, including melamine plates, children’s chairs, and 1940s-60s pastel-hued accessories. It’s a sure stop if you’re hoping to uniquely outfit the new baby’s nursery. 6. 3H Craftworks. This texture-rich store benefits both the manufacturer (a craft collective of developmentally disabled adults) and the consumer (you). 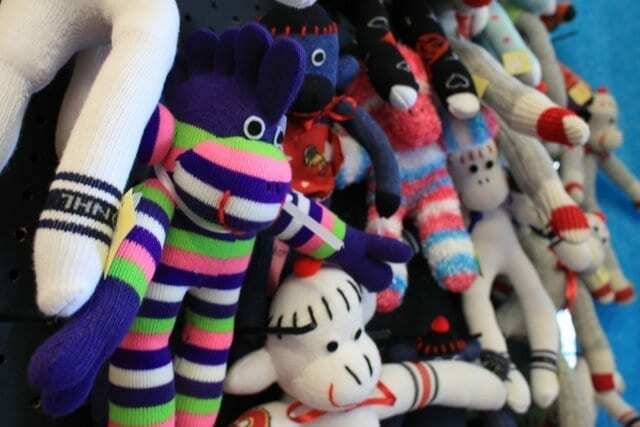 You’ll find imaginative storyboards, hand puppets, sun hats, hand-stitched dresses and yes, even a sock monkey or two. 7. Smoking Lily. Our family’s must-stop shop for unique screenprinted tees for teens and adults, cool skirts (well, only for the ladies of the family), beautiful housewares and other one-of-a-kind items. These ahead of the trend tees, dresses and skirts aren’t cheap, but you may luck into a sale. Do you have a favorite Vancouver shop? We’re celebrating Vancouver, BC with a week’s worth of Vancouver- and BC-centered posts. I’ll give you the skinny on my favorite kid-friendly hotels, restaurants and activities. Our family always stays in the downtown core or in the West End. The downtown core is convenient for catching the SkyTrain to Science World and walking along Vancouver’s “high street” – Robson Street. Downside: Very expensive parking, often starting at around $20/day. The West End is convenient to Stanley Park (which will soon become your kids’ favorite park in the whole world) and offers a U.N.-worthy selection of inexpensive, international eateries. I personally avoid staying anywhere along upper Granville street (before you hit Robson) or too near the Gastown neighborhood; both are too noisy and crazy at night for my taste. However, those areas are just fine for young people who like to party. Here are my top recommendations. We’ve stayed at many more Vancouver hotels over the years. If you’d like my opinion on a possible hotel, e-mail me at lora AT cascadiakids.com and I’ll let you know what I think. I’m sure there are additional hotels that could be added to our list here – add your recommendation if you like. You’ll also find more recs in my book, Northwest Kid Trips: Portland, Seattle, Victoria, Vancouver . The Westin Bayshore, Vancouver This bright hotel sits right on the edge of Stanley Park and offers expansive views of Coal Harbor. There’s a pedestrian path right in front of the Bayshore Westin – go northwest toward the park’s Vancouver aquarium and water playgrounds, or east toward the Coal Harbour Community playground and gelaterias. You can’t lose! This 511-room upscale hotel is a family favorite; kids love the children’s pack with toy treats and a free in-room movie. An incredible outdoor pool for sunny, warm days and an indoor pool for cloudy, cool days. It’s not cheap, however, and when we’ve stayed, we’ve stayed with Priceline (but the hotel doesn’t come up often). Posh. Vancouver Marriott Pinnacle Downtown Hotel. This hotel often comes up on Priceline. Thank goodness. Despite being part of a large chain, this Marriott quickly feels homey – we’ve seen the same staff working the front door for years. Guest rooms with two doubles work well for young families, and the location places you right down the street from the Coal Harbour seawall, movie theaters and Robson Street. Kids are welcome in the 52-foot indoor lap pool. For a splurge, try the morning breakfast buffet or pick up one of the online booking packages with breakfast included. The hearty spread is worth the expense. Posh. Times Square Suites. I’ll come out with it – this is my hands-down favorite spot in Vancouver. I love the location (right next to Stanley Park), the suite amenities (full kitchen, washer/dryer, separate sleeping area for grownups or kids) and the affordable parking. I love popping over to either a community or Granville Island market and picking up seasonal vegetables, locally made sauces and fresh pasta to cook right in my room. It is the place I always recommend to vacationing families, and you can often score a great deal by booking through their online site. The only downside: This aparthotel is right at a busy corner, so windows facing the street can get noisy, particularly on summer weekend evenings. Ask for a quieter room if you’re sensitive to noise (I am). It’s not the most luxe or fashionably appointed building, but it’s got everything a family needs to have a fantastic Vancouver stay. Cheap to midrange, depending upon season. Rosellen Suites. If the Times Square is too expensive for my weekend or I want a quiet place to stay, I opt for the Rosellen Suites. This hotel offers very spacious, family-friendly rooms that were once apartments; some rooms have been updated, others are a bit more worn. If a low price is your primary concern, go with the older “classic” suites, which are just fine if you’re not super picky. If you’re on the pickier side, go with the Personality Suites. Either way, you’ll find TVs, kitchens, free WiFi, and one- or two-bedroom options. The Katharine Hepburn Penthouse Suite is super-swank with over 1900 square feet of room, lovely contemporary furniture, two bedrooms and two bathrooms. Cheap. Granville Island Hotel. The upside: Wonderful location, right in the heart of Granville Island, where you’ll find a children’s market, a children’s theater, fresh and inexpensive restaurants, a playground and waterpark. Downside: Very small quarters for a family. Plan accordingly (as in, plan to be outside, enjoying your wonderful location). Families who are planning to make Vancouver their big-city, big-ticket vacation can request a luxurious Penthouse room, which comes with a Jacuzzi that looks out over False Creek. Niiice! Posh. Bonus rec: If you’re going with teens who enjoy vintage style or a stroller- or sling-carried baby — or even if you’re going on a parents-only holiday weekend — you may want to look into the character-rich Sylvia Hotel, located on English Bay. It’s a lovely, historic property, but the location makes it more of a haul for little legs. Cheap. Writer-broadcaster Jack Christie is one of Canada’s most trusted sources on travel, recreation and sport. And he did a quick Q & A on hiking with kids in Vancouver, BC. We should consider ourselves very lucky! As the outdoors columnist with Vancouver’s Georgia Straight newspaper (Canada’s largest circulation weekly) since 1986, he has filed over 500 reports, many of which are posted on line at straight.com. Jack, along with his partner in creativity, photographer Louise Christie, is the best-selling author of a series of 17 adventure guides, including 52 Best Day Trips from Vancouver , The Whistler Book: All-Season Outdoor Guide and Best Weekend Getaways from Vancouver: Favourite Trips and Overnight Destinations (Greystone Guides) . Does he have kids? “Louise and I have two grown boys who are now enthusiastically making their way in the world on their own two feet as well as by bike, skis, snowboards, and motorcycles,” Christie says, with characteristic aplomb. Let’s see what Jack says about hiking with kids in and around Vancouver, BC. 1. Is there a kid-friendly hike within Vancouver’s city limits that you recommend? What do you like about it? Based on our family’s experience, a “kid-friendly hike” is an oxymoron. Our kids told us they didn’t “get” hiking until they were 14+ teenagers. Stick to walks and let kids decide how far they want to go and what they want to see and do. 2. Is there a hike within 45 minutes of downtown Vancouver, that’s good for families with toddlers? A spot accessible by public transportation? 3. Can you recommend a similar hike (near downtown Vancouver) that’s good for elementary-age kids — children who can go a little further without complaint? 4. How about tweens and teens who can go as far as an adult? Do you have a recommendation for a close-to-downtown hike that’s still a bit challenging? Metro Vancouver’s sprawling Pacific Spirit Regional Park. Pacific Spirit Regional Park’s Wreck Beach stretches for 5 kilometres (3 miles) and can be accessed from a variety of trails numbered 1-7. Trail 6 leads to the section informally known as “Coney Island” where the majority of clothing-optional folks hang out. The Trail 4 approach that I recommend is naturally removed from the main action by a mile of rocky headlands and very family-friendly. Trail 4 starts with a 300-step staircase directly behind the UBC Museum of Anthropology and leads along a cobble-and-sand beach to twin gun towers, graffiti-plastered relics from World War 2. Lots of driftwood to picnic on, panoramic views of the mouth of the harbour and the Strait of Georgia. My kids loved the wild side of this section of beach. If families are really turned off by the sight of an occasional bare bum, try downhill along Northwest Marine Drive at the park’s Acadia Beach, next to the city’s Spanish Bank West Beach. They’ll find picnic tables and washrooms and a leafy, gentler approach to Wreck Beach where a colony of blue herons stalk smelt beside net-casting fishers. 5. What’s your favorite family-friendly hike between Vancouver and Whistler? What do you like about it? Who is it good for — which ages? 6. Do you have a gentle, family-friendly hike recommendation in or around Whistler, BC? The gentle Cheakamus Lake Trail in Garibaldi Provincial Park at the south end of Whistler leads through a spectacular forest to a stunning turquoise-hued lake at the foot of Whistler Mountain, or the multi-use Tin Pants Trail in Whistler’s Lost Lake Park with its twig-furniture benches and grand views of the mountains on all sides (Consult The Whistler Book: All-Season Outdoor Guide for details on both). Thanks for those family-friendly hike suggestions, Jack. Readers, I’d suggest picking up one of Jack’s books — he’s obviously an exceptional, detail-oriented writer who can offer wonderful things to do in and around Vancouver. Canadian-born Seattle resident Connie Wanklin-Iskra, her husband Matt, son Makhno (almost 3) and daughter Naomi (6 months) decided to enjoy a car-free weekend in Vancouver, BC. So, over the long US Memorial Day weekend, they decided to take the Amtrak train‘s route to Vancouver for a two-day trip. They boarded the Amtrak in Edmonds, Washington at 8:07 a.m. and arrived in Vancouver, BC, almost four hours later. 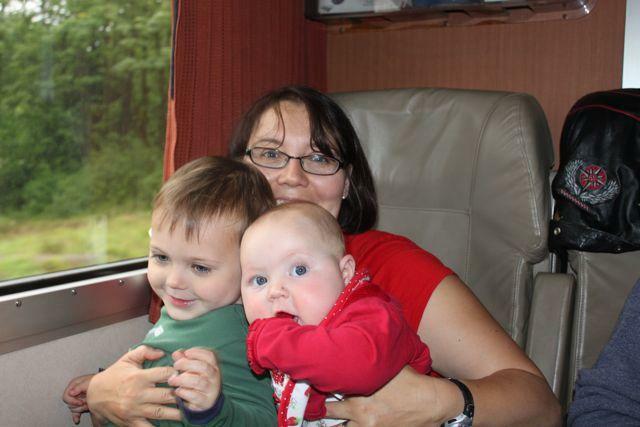 The train was $70 round trip for each adult, half-off for Makhno and free for her daughter (and other children under age 2). Once in Vancouver, it was non-stop schedule of fun. Let’s find out what they did and what they enjoyed about their train trip to Vancouver, BC. 1. What did you do in Vancouver, BC when you arrived via Amtrak? Customs in Vancouver was a bit of a wait — a good twenty minutes which feels like hours when carrying and infant and pushing a tired toddler in a stroller chanting “go, go, go.” Makhno did not enjoy this much, BUT it wasn’t as long as it might have been at the border in a car. After that we took the SkyTrain a couple of stops into downtown Vancouver and walked to our hotel. I tried to find a hotel close enough to the SkyTrain, as we brought the Ergo for the baby and the jogging stroller for our little guy. The hotel (Best Western Chateau Granville) was a splurge for a suite with a King size bed and a couch bed. But the room and living room really helped with putting kiddos to bed. My son Makhno likes to walk but the stroller had storage, and it’s also good for naps and a safe place to put the baby. Makhno fell asleep walking from the SkyTrain to the hotel, YEAH!!! We pushed him into the hotel and into the room and just relaxed until he woke up. Then we walked to Granville Island and took the rainbow Aquabus ($10 roundtrip for two adults), which he loved. On Granville, there’s a Kids Market with an indoor play area, climbing slides and more. But admission to the play area is $6 and our little guy, while a monkey pants, would probably get overwhelmed so we kind of discouraged it (better for ages 4 and up). The climbing area did have a small free slide, which satisfied him. The Kids Market also has all kinds of Loonie-powered vehicles that you can sit in, but Makhno is really happy just to play-drive, so again — no cost. We went outside and despite a drizzle, there’s a play boat the kids can sit in and pretend to drive, right outside the Kids Market. Also ducks on the water to watch and chase. Then we went to Granville Island’s Crystal Ark, where they have all kinds of smooth rocks. Makhno picked five green ones, for which they charge six cents a gram (similar to the Scratch Patch in Seattle). Afterward, we went and ate in the Granville Island Public Market, which offers something for everyone. 2. What did you do the next day in Vancouver, BC with kids? On Sunday we took the SkyTrain to the waterfront and the Seabus (Our son’s really into transportation!) across to North Vancouver’s Lonsdale Quay Market, another cool destination. At Lonsdale Quay, they have an indoor play space with a slide and ball pit, but this one’s free and smaller. Makhno actually remembered it from the last time we were there and he was only 20 months then. We had lunch– all of the market food courts are very kid- and budget-friendly; you can have anything you want. I found some excellent sushi, which I’ve been yearning for (and it’s much cheaper in Canada, I think). We took the Seabus back across. We then thought we’d try to walk to Stanley Park, also hoping to get a nap in. We enjoyed an AWESOME green space with neat sculptures to climb, as we walked along the Coal Harbour waterfront towards Stanley Park. Didn’t make it to the park, as we had to head back to the train (this time we were going to try and get there an hour early). Got him finally into the stroller and he fell asleep. station (located across the street from Science World). 3. Is there anything you wish you had done in Vancouver, but didn’t do? I’d like to take Makhno on the gondola up Grouse Mountain. One day we might even try the Grouse Grind, a local cult power hike of switchbacks that goes up to the top of Grouse Mountain. In the future we might like to try bring bikes, you can check your bike on the train (for a fee). 4. What did you bring with you on the train ride with kids to Vancouver, BC? We used one large traveling backpack and one smaller day back. We probably brought a few more clothes than needed but with little kiddos, you never know! We also brought more books and things to do then we might have needed but again with kiddos you never know. Having a couple novel things can come in handy. The jogging stroller was great too. It might have been hard to get on city buses but worked fine on sky train, with plenty of elevators to get on. We also brought our own snacks for the train, which was a good call. Of course you can’t bring fruit across the border, especially from Canada to US. Though we had done a pre-trip run to the general area, we still managed to miss a turn on the big day. So we definitely recommend the practice run if you are unfamiliar with the train station location. 5. Did you like the Cascades train, overall? Would you have done anything differently? The train made the journey really enjoyable for everyone. Easy to take kiddos to the washrooms which were very roomy and clean, with a change table and room to move. I could pass the baby back and forth and nurse if needed. She slept in my arms. The best part…no crying!!!! Well, at least on the way there. We returned in the evening, so everyone was getting tired. If you have a baby you will be holding her or him the whole time — which is great — but can also be tiring. Of course if you have an infant car seat this probably would eliminate this problem. On the flip side, my toddler would’ve slept in the car on the way home from Vancouver, but was too wound up on the train to settle down to sleep. He fell asleep from the train station to home, in the car! Crossing the border was also easier on the train with less waiting. On the way home the border officials board the train at Blaine on the way back to Seattle, to ask questions and check your documents, so you just wait in your seat which is pretty relaxed. Thank you, Connie! 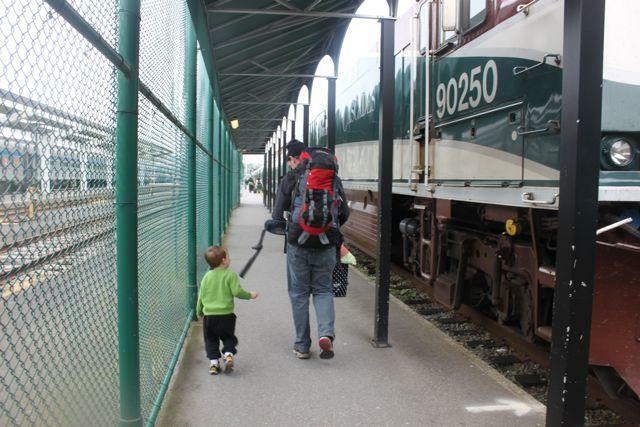 I can also vouch for this kid-friendly trip by Amtrak. We love to score seats on the western side of the train back to Seattle — and look out the windows at the sunset and rocky Washington shores. Vancouver’s expensive, I’ve heard families complain. I beg to disagree. With the right attitude and approach, you’ll find tons of affordable, family-friendly fun in and around Vancouver. Shoot your sister (or someone else’s) with a water cannon at the Variety Kids Water Park, Vancouver’s largest outdoor spray facility, according to the Vancouver Park Board. Ride a Miniature Train in Stanley Park. Sail aboard the SeaBus to Lonsdale Quay Market and jump in the ball pit. Eat a Japadog and walk along Robson Street for people-watching and shopping. No fear! Cross a (free) 50-metre-high suspension bridge at Lynn Canyon, then learn about the Lower Mainland’s wildlife and plants at the Ecology Centre. Ride the multicolored, tugboat-style Aquabus around False Creek. It’s like a mini-cruise, without the buffet, swimming pools or expense. Pop your toddler into a trailer and ride the Seaside Bicycle Route. Go for a pony ride at Maplewood Farm. Time travel to in Burnaby Village Museum on half-price Tuesday. Nibble on locally grown goodies at a Vancouver Farmers Market (multiple locations). Take a dip in the heated, sunny saltwater at Kitsilano Pool. Enjoy one of the awesome festivals on The Drive (don’t forget to order your scoop of gelato from one of the Italian gelaterias). 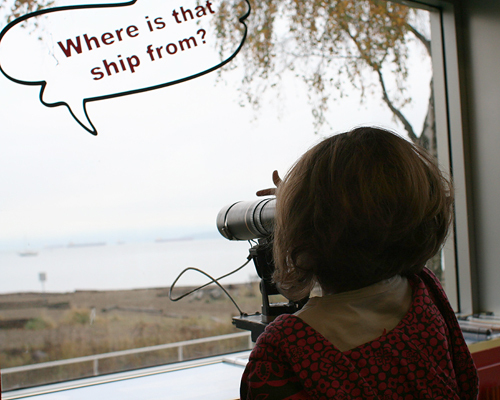 Visit the Vancouver Maritime Museum and meet a pirate or seven. Not a bad price, but a real family deal with the coupons you’ll find on the museum’s site. Go on a North Shore family hike for incredible views and kid-friendly trails. Pick up Pokemon cards and egg tarts in Chinatown. Better yet, head there during the Chinatown Night Market. Chill out on rainy or very hot days in the children’s area of the Vancouver Library, then walk among the library’s architecture, a harmonious blend of Roman and contemporary structures. Jump on the bouncy castle and crawl through an inflatable obstacle course at the West End Community Centre’s enormous Kidz Zone. Meander through the Nitobe Memorial Garden, one of the top five Japanese gardens outside of Japan. Shop for saris and sweets at the few-blocks-long Punjabi Market. Introduce your preschool Picasso meet modern art at the Vancouver Art Gallery on Tuesdays between 5-9 p.m., when admission is by donation. Play in the toddler pool at the Vancouver Aquatic Centre. Make your own lapel pin with a typewriter, paper, markers and the helpful staff at Regional Assembly of Text. Share a basket of fish and chips and enjoy Steveston Village’s seaside charm. Go on a bat or bird walk with the Stanley Park Nature House. Watch Harbour Air seaplanes take off and land in Coal Harbour while the kids play at the Coal Harbour Community Centre playground. Watch an outdoor Movie in the Park or another free outdoor movie. Ride the futuristic SkyTrain to an Asian-style mall in Richmond. Walk among peaceful bridges and ponds at the Dr. Sun Yat Sen Chinese Garden during the last half-hour of the day, when admission is by donation. Play in the sand, barbecue hot dogs, splash in the heated pool and make new family friends at Second Beach. Fly a kid’s kite in Richmond’s reliably windy Garry Point Park. Take your photos in front of the cool, iconic sails at Canada Place. Check out the Gordon MacMillan Southam Observatory with starry-eyed children on Saturday evenings, when admission is by donation. Take your little engineer to Burnaby Central Railway for a ride on a mini-train. Kids actually sit on top of your train car — not in a train car. Shoot down a water slide at Granville Island Water Park. If the kids work up an appetite, you’re lucky to be on Granville Island, where the Public Market‘s cheap treats are just around the corner. Looking for more inexpensive, fun family-friendly things to do in Vancouver? Check out Kids Vancouver’s post on summer activities or read my book, Northwest Kid Trips: Portland, Seattle, Victoria, Vancouver (and order from my link, please? ).